As a Friend of the Library, you will receive our bi-monthly newsletter with all of our programs listed. The membership contribution will go towards purchasing new materials and supplies for the library, staff development and training, and public programs and classes. Due to the rising cost of first class mail, membership cards will be mailed to NEW members only. 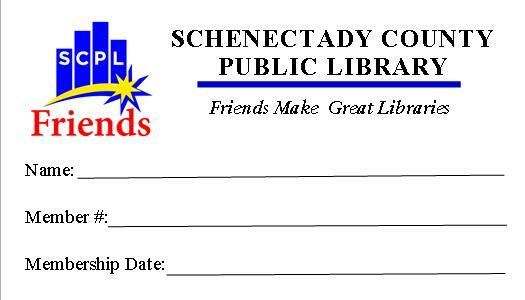 For 13-18 year olds, try joining the Junior Friends of the Schenectady County Public Library.